When it comes to search, movers are what is known as SAB’s. That sounds like a cuss word, but I assure you it isn’t. It stands for Service Area Business. That means that typically customers don’t come to you, but instead, you come to them. As a moving company, your customers are almost always local. You have a central location, perhaps a truck yard with an office and warehouse and you drive to the customer’s location to perform the move. This is clearly the opposite of a brick and mortar location where customers come to you. This presents a bit of a challenge for Google. If you are a mover in Atlanta, you most likely also serve the wealthy Atlanta district of Buckhead and beyond. The best way to indicate to Google the areas you do serve, so that they know when to show you for local results, is within your Google My Business listing within the info section. Here is a sample of how to tell Google the radius you serve from your physical location. After you have done that, you need to make sure you have your digital business cards spread throughout the internet. Digital business cards? What the heck is that? Well, it is any listing where your company Name, Address and Phone number are listed. This is commonly referred to as your NAP. Moreover, these digital business cards are more commonly called citations. This is one way Google allows you to build trust across the internet. By leaving your “digital business card” in as many places as you can. If a website or directory that has very high authority “accepts” your card and displays it for you, it is a vote of trust for you and again, Google then gets the signal that you are trustworthy. Here is a citation report for one of our clients. 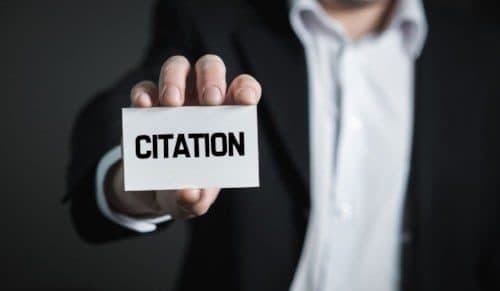 It shows that they are adding citations every month. Getting citations is done manually and can be relatively easy. Think of any website that works like a directory. Yelp is one, thumbtack.com is another. Generally, it is best to target 3 types of citation sources. The first is general directories and databases, the second is directories that are just for moving companies, and the third are directories that are local to your area, such as Chamber of Commerce, public records, the list goes on. Once you find a directory, in most cases, you simply register your business online and submit the details and you are done. If you have ever come across a site that has your company information on and asked you to verify or “is this you” – that is a directory site. Here is a list of moving company citations you can use, courtesy of WhiteSpark. Once you know your current citations, first fix the ones that are incorrect, then start building new ones and submitting them. You can stop when you get to about 200 of them. That seems to be the number that optimizes the signals to Google that you are trusted and real. If you need any help feel free to reach out to us.